Shaheed Bhai Manbeer Singh Chaheru aka Iqbal Singh aka Hari Singh was born in 1959 at village Chaheru of Kapurthala District in Panjab. His father Sardar Mohinder Singh was a well to do farmer and had lived in the village for generations. Manbeer Singh completed his primary education at his village school and at Kala Bakra, village of his maternal aunt; he completed the 10th grade and then started to assist his father in farming along with his two brothers and continued to do so for next six years. During these six years Manbeer Singh continuously use to visit his maternal aunt, Niranjan Kaur, at Kala Bakra village and that is where he came in contact Giani Joginder Singh of Chak Raju Singh village who was a retired army officer and son-in-law of Niranjan Kaur. Giani Joginder Singh encouraged Manbeer Singh to take up the baptism, Amrit, and become a True Sikh of Guru Gobind Singh Ji. Manbeer Singh was 19 years of age when the Nirankari Saka took place in which 13 Sikh’s were shot and killed on April 13th, 1978. This incident left a deep mark on Manbeer Singh’s thoughts; he was later married with Bibi Ranjit Kaur. In 1979 at Sodal Gurdwara in Jalandhar, Manbeer Singh along with his wife and his father’s younger brother, Karnail Singh, took Amrit from Baba Nihal Singh Harian wela wale. After baptism Manbeer Singh started to attend religious classes being provided by Damdami Taksal at Gurdwara Gurdarshan Parkash, Mehta Chownk and that is where he met Bhai Mohkam Singh, Bhai Gurbant Singh, Bhai Prem Singh and Sant Jarnail Singh Ji Khalsa Bhindranwale. In 1981 a police car followed his motorcycle as he left the grain market towards his home. The police car caught up to him, pulled him over and then the SSP of Jalandhar, GurIqbal Singh Bhular questioned Manbeer Singh on his actions and where he was going. After a heated argument Manbeer Singh was arrested but was released on bail by his uncle Karnail Singh who said that Manbeer Singh will show up at Police station tomorrow. After this incident Manbeer Singh left for Sri Harmandar Sahib and met with Sant Bhindranwale, Manbeer Singh told Sant Ji about the Police incident Sant Ji then told Manbeer Singh to stay with them were he would have a duty to serve in the Langar, after some time Manbeer Singh became Sant Ji’s bodyguard. Meanwhile, the Police arrested his uncle Karnail Singh for not bringing Manbeer Singh to police station as promised. Manbeer Singh started staying in room 53 of Guru Nanak Niwas along with Giani Joginder Singh, Bhai Sant Singh, Bhai Malagar Singh and Bhai Gurtej Singh. He also came in contact with Bhai Sukhdev Singh Panjwar aka General Labh Singh. Bhai Major Singh Nagoke, Bhai Balwinder Singh Khojkipur, Bhai Joginder Singh Rode, and Bhai Kabal Singh. During the Sikh Holocaust referred to as Operation Bluestar in 1984, Bhai Manbeer Singh was not at Sri Harmandar Sahib. In 1984 he visited the Damdami Taksal headquaters located at Gurdwara Gurdarshan Parkash and met Bhai Bachan Singh, Sant Singh, Balbir Singh, Dalbir Singh and Bhai Mohkam Singh. Here he was told that Sant Ji is alive and so decided to leave for Pakistan. During this time Manbeer Singh came in contact with many other youth workers, including Bhai Harjinder Singh Jinda, like him who was hurt by the Indian Government for attacking Sri Harmandar Sahib. In 1986 Manbeer Singh and Bhai Balbir Singh Raipur planned to release General Labh Singh and Sawarnjit Singh from Police custody. Balbir Singh arranged a car and Bhai Jarnail Singh arranged a jeep as a get away vehicle. They planned to execute their plan to free both Singh’s from police custody on the day when Sukhdev Singh and Sawarnjit Singh were brought to court for their monthly hearings. Manbeer Singh, Ajitpal Singh, Balbir Singh Raipur, Rashpal Singh, Jarnail Singh met outside the courts. Manbeer Singh was carrying a stein gun and all other Singh’s had revolvers. When Sukhdev Singh and Sawarnjit Singh arrived under heavy police protection, Manbeer Singh signalled them to go to the washrooms and once they went Manbeer Singh and his partners opened fire on the policemen, six policemen died on the spot. They were able to free General Labh Singh, Sawarnjit Singh and Gurinder Singh Bhola. During this time Manbeer Singh also came in contact with a retired army officer, Major Baldev Singh Ghuman, at Sri Harmandar Sahib and Mehta Chowk. Major Baldev Singh Ghuman was saddened by the Operation Bluestar Massacre and wanted to do something to improve the Sikh turmoil in Panjab. Manbeer Singh and Baldev Singh Ghuman became good friends and they both respected and trusted each other. During 1986 Baldev Singh Ghuman became the middle man and united the AISSF (Ropar Group) and Khalistan Commando Force (KCF – Chaheru’s group). But Sarabjit Singh Ropar, president of AISSF, who was son of a DSP, became a Police informer and called a meeting at Baldev Singh’s house were Manbeer Singh was also invited and on August 8 1986, Manbeer Singh was arrested by Police at the residence of Major Baldev Singh Ghuman in Jalandhar. The Police also arrested Major Baldev Singh Ghuman, and Charanjit Singh. The raid was conducted by DSP Sawarn Singh “Ghotna”, a well renowned ‘butcher’ police officer. After Manbeer Singh’s arrest General Labh Singh took over the command of the KCF. Manbeer Singh Chaheru was kept in various jails in Panjab and later moved to a jail in Bihar. Manbeer Singh always stayed in Chardi Kala during his jail time and would continuously read Sri Japji Sahib and constantly pray that one day he would be able to give his life for the Sikh Faith. 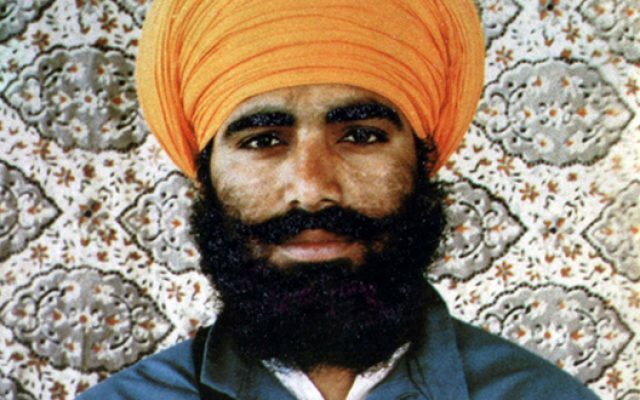 In December of 1987 Police announced that Manbeer Singh escaped from the Police custody while Police were transporting him back to Panjab from Bihar, but in fact the police had killed him and had disregarded his body into Beas River. In Chandigarh the Panjab Police Chief J.F. Rebeiro told news reporters that they don’t need to worry as Manbeer Singh will not come back.